The Division for Student Success and Retention (DSSR) is dedicated to enhancing retention and graduation rates through student academic support services that are available to all students at Bennett College. The services include Disability Services, Mentoring, Tutoring (Curriculum Learning Center), Supplemental Instruction, Academic Advising, Orientation 100-A&B, Emerging Scholars Program, Library Services, and the Honors Program. The Division’s broad-based initiatives are aligned with the College’s mission to provide learning opportunities for all students. Our approach is evidence-based and designed to provide exceptional services to all students that will ensure proper access to academic support services. The mission of The Division for Student Success and Retention is to provide comprehensive tutoring services, supplemental instruction, mentoring, and advising to all students throughout their matriculation at Bennett College. Student success professionals are committed to providing an exceptional learning environment that enables individuals to develop their full potential, pursue their dreams and become enlightened leaders in local and global communities. 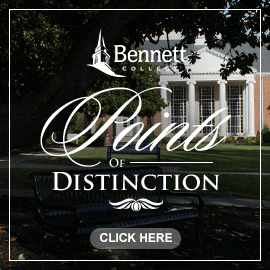 To increase retention and graduation rates by providing students with access to free tutoring in core courses, success skills seminars, mentoring, supplemental instruction, and academic advising, thus fostering the independent, critical thinking skills that all students need to succeed at Bennett College and beyond. To maximize every student’s potential to achieve academic success and to adjust responsibly to the individual and interpersonal challenges presented by the College. To provide resources and support services that will ensure student success through the coordination and collaboration of all academic divisions on campus. Students are expected to take an active role in their education by participating in all available resources offered on campus that will enhance their learning. Students must be prepared to learn and to be intellectually challenged. The Academic Advising Coordinator assists students with meeting their academic goals and developing high, but realistic expectations of their college experience. The Academic Advising Coordinator also provides academic advising for all undecided student majors, maintains and gives advisement for the majors’ change process, assists with academic assessments, monitors probationary students, conducts faculty advising workshops, and provides supplemental advisement for all majors. Another component of academic success is the Early Alert/Intervention program, which is used to send alerts to students who are in jeopardy of not meeting the College’s expectations and goals. Emerging Scholars (ES) are students who have been admitted to the College with a high school cumulative grade point average of 2.0-2.39. Students remain Emerging Scholars for their entire Freshwoman year (2 semesters). Emerging Scholars are restricted to a maximum of 15 credit hours per semester while they are on Emerging Scholar status and provided with various academic support programing to promote their success. These students are required to meet once each month with the Academic Advising Coordinator and attend success seminars, tutoring, and supplemental instruction sessions if needed. The monthly meeting is designed to check in with students, provide guided support throughout their semester and resolve any difficulties. The success seminars offered consist of several skill building concepts such as, test-taking strategies, goal setting, time management, college etiquette, stress management and additional topics as requested. There are a series of monthly Success Seminars and Workshops in which Emerging Scholars are strongly encouraged to attend. The goal of the Mentoring Program is to help retain the incoming Freshwomen class through guided mentorship, learning community activities, skill building, and goal setting. The peer mentors will serve in a variety of capacities to the first year students. They will provide accurate information on how to navigate through college, college success tips, and how to build personal connections to the College and surrounding community. The mentors and mentees will complete training and participate in monthly group activities that will help build their relationship. Supplemental Instruction Leaders (SI) assist students with improving their academic experiences in designated gateway courses. This academic support model is a peer-assisted study session to improve student retention and success in historically challenging courses. The Supplemental Instruction Leaders attend the class during the designated times and hold sessions after the class to assist students with understanding concepts. Orientation 100-A, Part I of Orientation 100, is a required one (1) credit hour course designed to assist first year and transfer students with less than 26 transferable credit hours with the positive integration into the academic community of Bennett College. Students must successfully complete Orientation 100-A and 100-B in order to meet Bennett College’s graduation requirements. This class is designed to be interactive and dialogue-driven. Topics covered include the history, traditions and culture of the College, time management, study skills, understanding your learning style, test-taking skills, self-motivation, values, and preparing for student success. The mission of The Office of Disability Services (ODS) at Bennett College is to provide, coordinate, and advocate for services which enable undergraduate students with disabilities to receive equal access to a college education and all aspects of college life. Academic growth, disability management, and self-advocacy skills for students are supported and enhanced by providing reasonable accommodations and information for students. We not only assist students with disabilities, we also collaborate with other departments on campus to provide services for faculty and staff. The Disability Services Program addresses the academic needs of students with learning differences through consultations, referrals, and accommodations plans. With proper documentation, reasonable accommodations will be provided to all students.